I recently had a discussion with an associate DJ who was complaining about the lack of paid DJ work available for small disco-party and wedding events. I explained that this is due to customers using their own music rather than paying for a DJ. Work undertaken by Datarhyme in 2012 saw an increase where customers used their own music, by as much as 50 percentage. This is due to a combination of austerity, the availability of music and music player technology. Laptop running iTunes remotely controlled with an iPhone. Datarhyme doesn’t supply DJ services but we have seen low hire rates for DJ equipment. 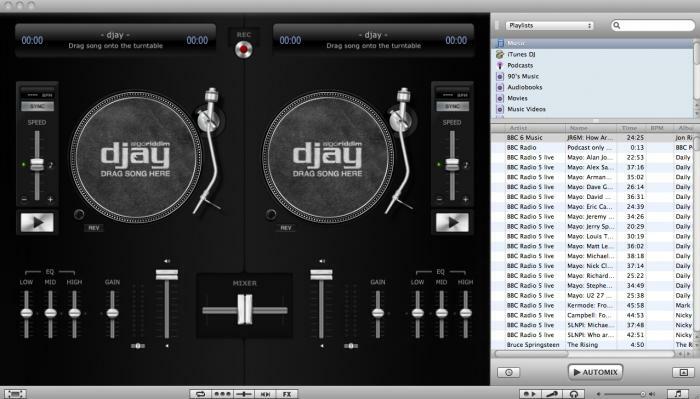 There seems to be very little demand for professional DJ mixers and CD decks. This is possibly due to DJ’s owning their laptops and controllers so there is no need to hire a professional mixer or CD desks. This trend will continue in 2013 and beyond so DJs and hirer need to adjust their strategies or face bleak prospects.